In a statement issued today, France's New Anticapitalist Party (NPA) offers solidarity to the victims of the attacks in Paris on Friday night, and also condemns the bombing carried out by French warplanes in Syria. "In a pitiful intervention, Hollande broke down and stammered some words about the Republic. He who plays the war leader and carries an enormous responsibility in this new tragedy asks for 'confidence'. He decreed a state of emergency throughout France, considering that the answer was to trample on fundamental freedoms. He was immediately supported by Sarkozy. The political authorities can thus from now on ban public meetings and control the press. Once again, main people responsible for thissurge of barbarian violence are calling for national union. They are trying to turn the dramatic situation to their advantage to choke off indignation and revolt. They have a ready-made scapegoat, Muslims. We reject any national union with those responsible for wars, the bourgeoisie, Hollande, Sarkozy and Le Pen. We denounce the racism that the State brews in the name of the supposed "values of the republic" at the same time as, under cover the fight against terrorism, democratic rights are threatened. We ask for the lifting ofthe state of emergency." "To put an end to terrorism, it is necessary to put an end to the imperialist wars that aim to perpetuate the plundering of the wealth of the peoples dominated by the multinationals, to force the withdrawal of French troops from all countries where they are present, in particular in Syria, in Iraq, in Africa." 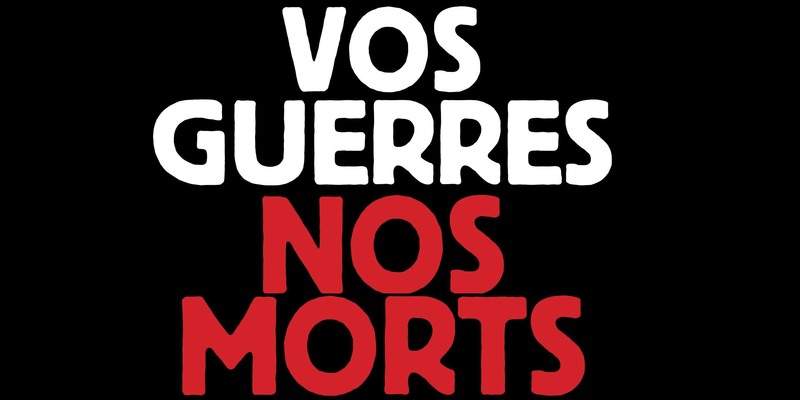 Leurs guerres, nos morts: la barbarie impérialiste engendre celle du terrorisme - Full statement by the NPA in English. The cruelty of imperialist wars results in the cruelty of terrorism - Full statement by the NPA in English.